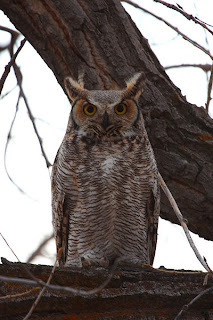 As I mentioned in my previous post, winter is the best season to watch or simply listen to owls. In some parts of the Northeast, prime owl-watching season has already passed, but you can still find full-moon walks, winter nature walks, and daytime owl programs at nature centers, parks, and AMC’s lodges through March. February 28 and March 30 are full moons, so look for full-moon walks around these dates. A nice summary of the owls’ “night shift” from Connecticut Audubon. Full Snow Moon Walk at Haley Farm. Groton, Conn. Sunday, February 28. The Denison Pequotsepos Nature Center in Mystic, Conn., which runs this walk, held its Owl Prowl on February 18, but it’s quite possible that owls will make an appearance at this program. Full Crow Moon Walk at the Walden Preserve. Denison Pequotsepos Nature Center, Mystic, Conn. Monday, March 29. Full Moon Walks. Connecticut Audubon Society at Trail Wood, Hampton, Conn. Saturday, February 27, and Sunday, March 28. Raptor Aviary and Visitor Center. Sharon Audubon Center, Sharon, Conn. Although the Sharon Audubon Center has no owl walk scheduled, the center cares for owls and other raptors in its raptor aviary, and its visitors’ center has live-animal displays and other nature discovery exhibits for children and families. Maine Audubon has a Maine Owl Monitoring Program that begins on March 5. Moon Rise Owl Prowl. Holly Hill Farm, Cohasset, Mass. Saturday, February 27. Full Moon Owl Prowls. Broadmoor Wildlife Sanctuary, Natick, Mass. Friday, February 26 and March 27. Life in the Cold: Exploring in Winter. Pinkham Notch, NH. Saturday and Sunday, March 5 and 6. AMC senior naturalist Nicky Pizzo runs a full-day program at Pinkham Notch. Winter Evenings at the Meadows. Cape May Bird Observatory. The Nature Conservancy’s Cape May Migratory Bird Refuge, NJ. Friday, February 26. This “winter evening” will be looking for such signs of spring as woodcock mating displays and snipes on the move. Animal Tracking: The Basics. New Jersey Audubon Plainsboro Preserve, Plainsboro. NJ. Saturday, February 27. Whooo said that? Orchard Beach Nature Center, Pelham Bay Park, NY. Sunday, March 14. Owl Prowl. Peace Valley Nature Center, Doylestown, Pa. Saturday, March 6. Owl Prowl. Bucks County Audubon Society at Honey Hollow, Solebury, Pa. Friday, February 26. The History of Barn Owls. Audubon Society of Western Pennsylvania. Pittsburgh, Pa. Saturday, March 13. Full Moon Family Foray. VINS (Vermont Institute of Natural Science), Quechee, Vermont. Saturday, February 27 and Saturday, March 27. This is by no means a complete list of all the ways that kids and families can learn about owls, or take full-moon walks, so I hope you'll add any I've missed.